Antihelmintic drug for dogs and cats containing praziquantel as an active ingredient. Plain white tablets with a scoreline on one side and logo (a cross in the center of shield) on another. 6 tablets in blister pack. Outer (secondary) package - carton. Effect on all development phases of tapeworms. 1 tablet of Azinox contains praziquantel (as an active ingredient) - 50 mg, as well as excipients. The mechanism of praziquantel action (a component of the drug) includes broad-spectrum antihelmintic effect on all development phases of tapeworms parasitizing dogs and cats, induces paralysis and death of a worm. Praziquantel absorbs into gastrointestinal tract. Peak plasma concentration is achieved in 30-60 min. For treatment and prevention of canine and feline echinococcosis, teniasis, dipylidiasis, diphyllobothriasis, mesocestoidosis. Do not use in puppies and kittens under 3 weeks old. Idiosyncrasy. Azinox for dogs and cats is intended for individual oral administration in a single dose with small amount of feed during a morning feeding or forced administration (1 tablet per 10 kg of body weight). 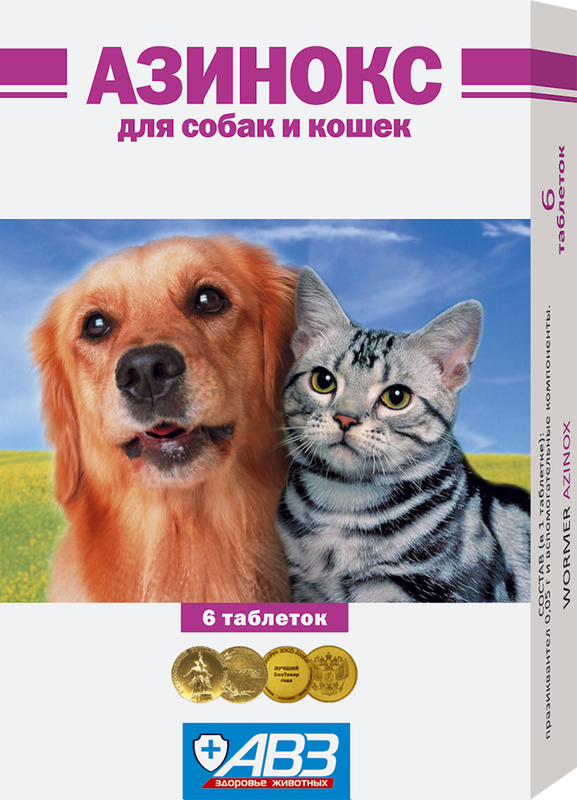 If canine/feline body weight is less than 5 kg, use aqueous suspension of the drug. To prepare it disperse 1 tablet, suspend it in 10 ml of water, actively shake and administer immediately with a syringe without a needle (1 ml of suspension per 1 kg of body weight). Previous starvation diet and cathartics administration are not necessary before animal deworming. Treatment: according to indications. Prevention: quaterly, in therapeutic dose. Stop drug administration in case of increased sensitivity to praziquantel and allergic reactions. Store Azinox for dogs and cats in closed original package. Protect from light and moisture. Store separately from food and animal feeding at 0-25°С. Keep out of the reach of children and animals.